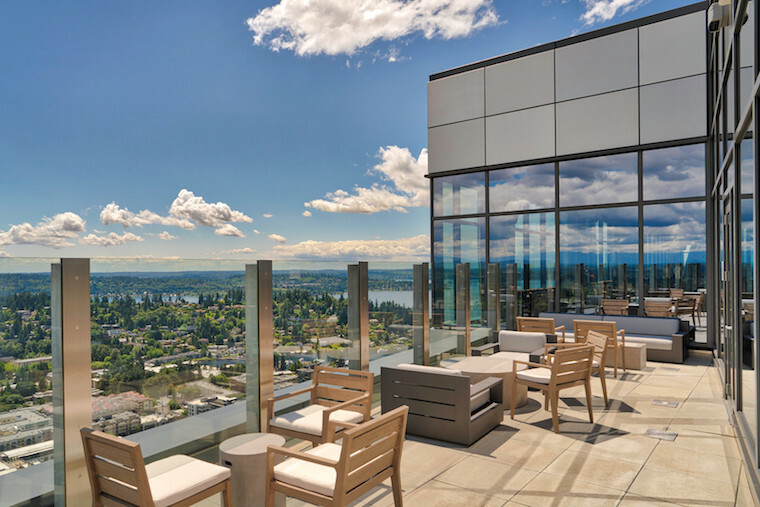 Bellevue’s most breathtaking new views can be found from one of three (!!!) patios that wrap around this epic 31st-floor steak-and-sushi restaurant. From that height, you can see the greenbelts, the waterways, how the Columbia Tower dwarfs the Space Needle, how busy 405 is at rush hour. This place will surely be a hit with the after-work crowd, but it’s a special enough spot we’re guessing folks will be heading over from Seattle to experience it, too. When sibling eateries Blind Pig Bistro and Babirusa both closed in Eastlake, they combined forces in this new Belltown spot that’s already twice the space they had before. And then they remodeled the patio—an all-weather, covered space that runs parallel to the sidewalk. The whole menu is available there (including the recommended chef’s tasting menu), and it’s rentable for private parties as well. Space Needle views, stellar burgers and an outdoor patio? Popular local burger chain Li’l Woody’s has outdone itself with the most recent addition, a South Lake Union stunner that marks the first location to have a bar—perfect for sipping cocktails or boozy shakes al fresco. Also: order the burger dumplings, they’re a specialty you won’t be able to find at Ballard, Capitol Hill or White Center outposts. This new Central District restaurant with a heavy focus on bright, herbaceous Vietnamese flavors, has a pretty great happy hour—$4 dishes like papaya salad and crispy rolls stuffed with roast duck, plus an assortment of house cocktails, wine and beer for $6. All of this can be enjoyed on the patio, just head out the back door and grab one of the graffitied tables. Though this exceptional Ballard sandwich spot has been open more than a year now, its patio is still one of the best in town—and shockingly you can almost always find a seat. Order inside, where you’ll want to get an order of skins ‘n’ ins potatoes to go with your steak tartare club, and head around back, where a tucked away, gravel-lined patio features a ping pong table, a kiddie play house and plenty of picnic tables. White Swan Public House’s seasonal fish shack offers a view not unlike Westward’s (just a different position on the lake), but arguably better options for parking and likelihood of scoring a seat outside plus the food is really, really good. If it’s available, get the seafood chowder. And if it happens to start raining—hey, this is Seattle after all—head inside to White Swan Public House to enjoy lunch at a table there. Ethan and Angela Stowell’s newest restaurant is an homage to food-loving parents everywhere: a lovely, light-filled restaurant where you can find both an excellent margarita and an enclosed play space for maximum all-ages dining-out enjoyment. If the upstairs area nearest the kid pit is full, enjoy your meal downstairs on the sidewalk patio—perhaps the people watching will keep the kids equally entertained.